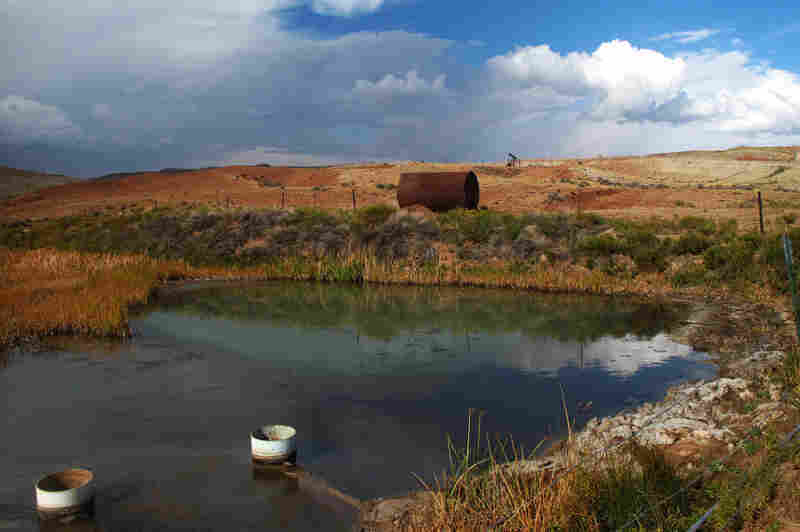 EPA Wants To Allow Continued Wastewater Dumping In Wyoming The environmental agency has proposed permits that would allow oil companies to continue releasing contaminated wastewater onto the Wind River Reservation in central Wyoming. NPR found last year that the EPA has been allowing oil companies to send so much wastewater onto dry land that it was creating raging streams. More than 40 years ago, the EPA banned oil companies from releasing wastewater into the environment, but made an exception for the arid West. If livestock and wildlife can use the water, companies can release it. Cows like these grazing near a stream of waste on the Wind River Reservation in Wyoming are supposedly the reason the EPA lets oil companies release their waste into the environment. The EPA requires that the wastewater streams show no obvious sheen and no solid deposits. 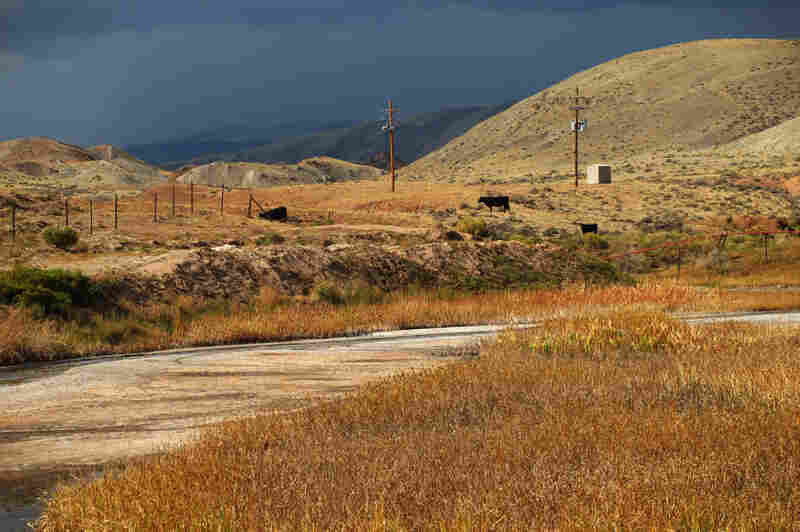 But both were visible near oil fields on the Wind River Reservation in Wyoming during a 2012 visit. 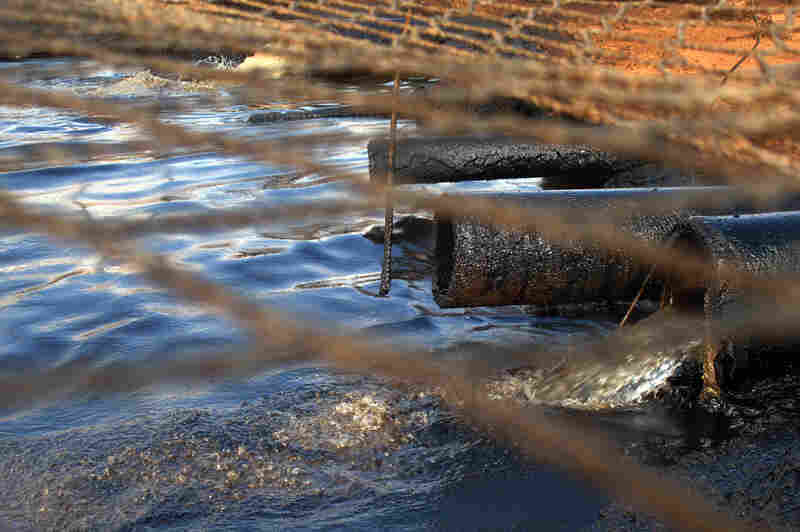 Dirty water from the oil wells flows through oil-caked pipes into a settling pit where trucks vacuum off the oil. A net covers the pit to keep out birds and other wildlife. Streams of this wastewater flow through the reservation and join natural creeks and rivers. Wes Martel, vice chairman for the Eastern Shoshone Business Council, stands near a murky gray stream full of oil field wastewater. He's concerned about the effects the wastewater has on wildlife, water quality and, since cows drink it, he wonders: "What's in your steak?" Internal EPA documents released to NPR show some EPA staffers have been trying to figure out what is in the wastewater released by oil companies. There are lots of chemicals. 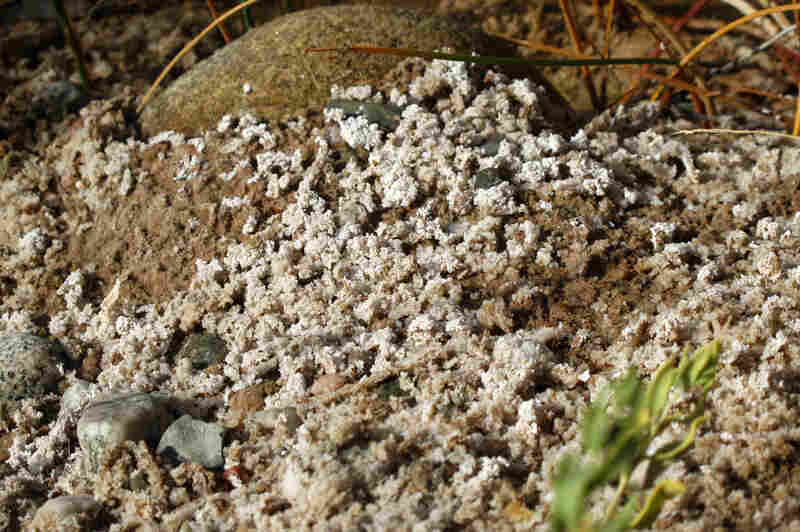 Some leave solid residues like these white and gray mounds. Danger signs near this outflow pipe warn that poisonous gas fumes from the water can cause respiratory irritation or suffocation. 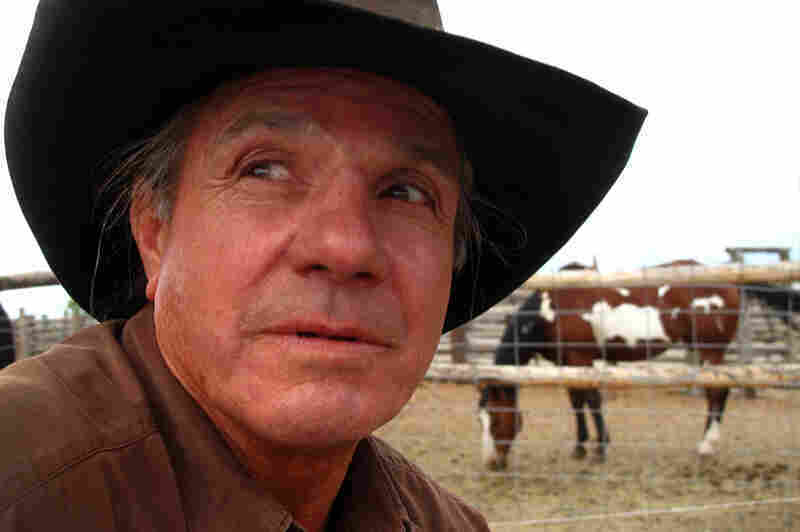 Rancher Darwin Griebel says his cows need the oil field water, and his business depends on it. White crystal-like deposits line a streambed where this oil field water is flowing. Researchers for the tribes have also found black oozes, purple growths, dead ducklings and lifeless stretches of streams. In most oil fields, the water that companies pump up with the oil gets reinjected deep underground. But the federal government allows a dozen oil fields on the Wind River Reservation in Wyoming to pump streams of this wastewater onto the land. An NPR investigation last year discovered that the EPA was allowing oil companies to send so much of this contaminated water onto dry land that it was creating raging streams. At the time, there was a controversy within the agency over whether to keep allowing this practice, according to documents NPR obtained through a Freedom of Information Act request. On Friday, the EPA will close the public comment period on proposed permits for several oil fields on the reservations. The proposed permits include some additional restrictions, but would allow companies to continue releasing the water. Some scientists and environmental groups say allowing companies to release the wastewater is wrong, especially since it contains hazardous chemicals. 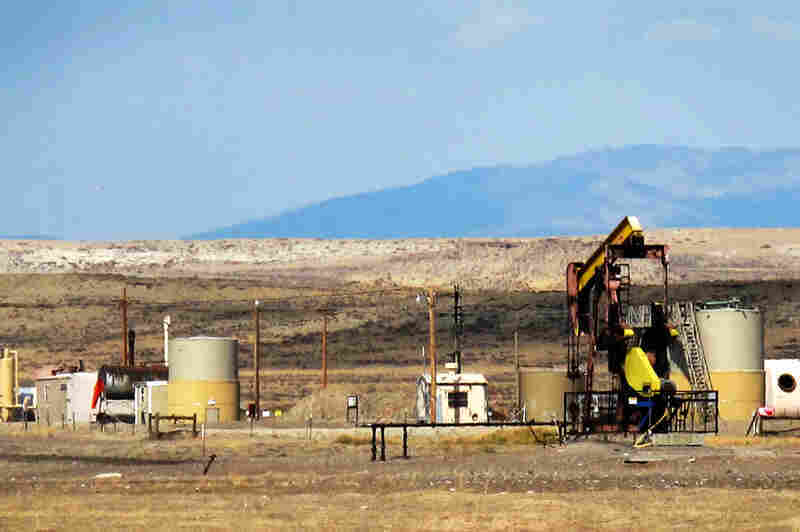 And on Wyoming land outside of the reservation, state rules ban companies from dumping water after it's been used for hydraulic fracturing or other chemical treatments. "I am surprised that it's still allowed. It looks like the protections for tribal citizens here are weaker than those for citizens in Wyoming that surround them. If so, that's wrong," says Robert Jackson, a professor of environmental science at Duke University. On a visit to the Wind River Reservation last fall, I saw streams of wastewater flowing from several oil operations. Some of the water had oily sheens on top. At one operation, something in the wastewater was creating solid formations under where pipes dumped water into a lake. 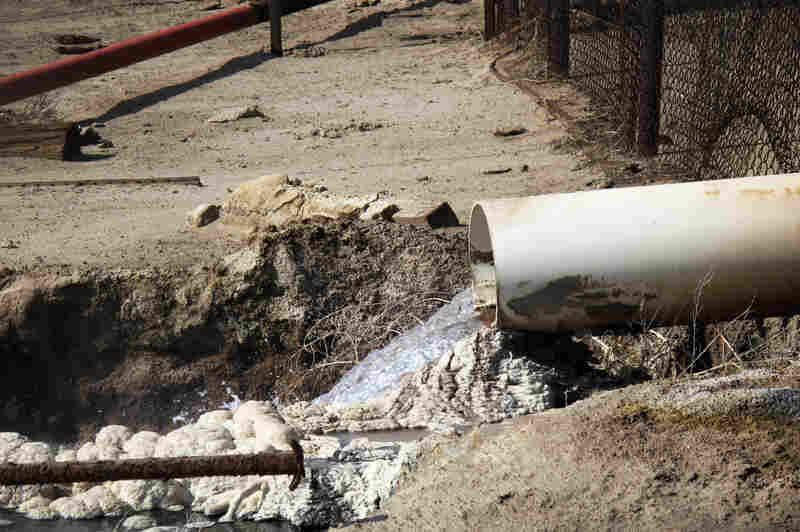 And some of the wastewater smelled very strongly of rotten eggs — a sign of hydrogen sulfide, which can be deadly if inhaled at high enough levels. Signs near the wastewater warned of the danger, and when I stood near one of these water outflows with tribal representatives, oil company workers drove up and warned us to leave quickly, because of the dangerous gas. 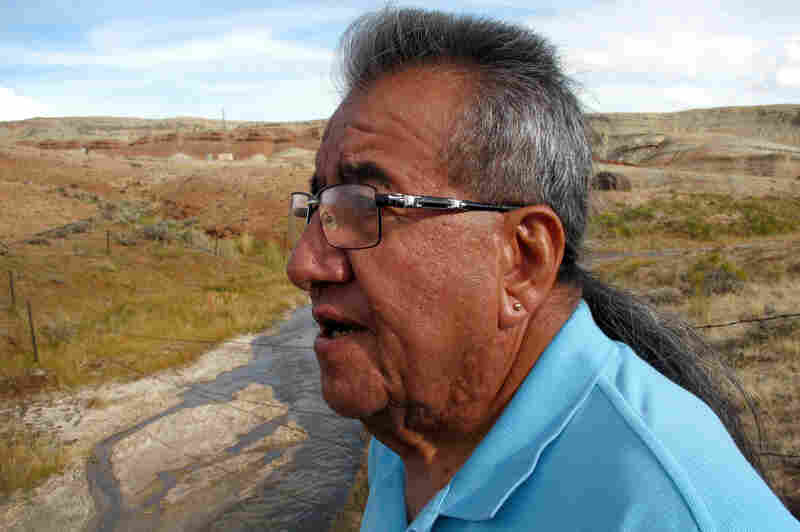 As we stood at one raging stream of the wastewater, watching cows and wildlife that drink the dirty water, tribal leader Wes Martel told me it's clear to him that the EPA should not let this happen. "Well, especially this volume of water," Martel said as the water flowed by. "And this is constant. So it really makes you wonder what kinds of impacts is this having, on not only aquatic life but our wildlife." He also voiced concerns about whatever chemicals might be accumulating in the cows we saw near the stream. "And when that goes to the slaughterhouse, what's in your steak, right?" One of the EPA permits up for renewal belongs to Eagle Oil and Gas Co. Darrell Lohoefer, president of the Dallas-based company, says the water that comes from his operation "looks like a flowing small creek." Lohoefer says the water has created artificial wetlands, and "extensive wildlife are thriving in it." He admits it's rare for companies to dump their wastewater on the surface like this. In most of the country, oil companies aren't allowed to do that. But decades ago, an exception was made in the West, if ranchers wanted water. And in this arid land, any water is appreciated. But Lohoefer says his wastewater is fresher than most oil field water elsewhere, and neither the livestock nor the wildlife show negative effects. Lohoefer says he never adds any chemicals to his well, but other operations do. That's clear from documents NPR obtained from the EPA and from the new permits the EPA has proposed for those operations. Other companies with permits being renewed refused multiple requests for interviews. Under the new permits, companies would have to test for naturally occurring chemicals that could be flushed up with the oil from deep underground, and the EPA would set some stricter limits for how much of some of those naturally occurring chemicals could be in the water. But some environmental groups say the permits ignore the chemicals companies add to their wells. "What they don't mention is the maintenance fluids and the fracking fluids — chemicals that have been introduced down-hole, as it were," says Jeff Ruch, executive director of Public Employees for Environmental Responsibility, an environmental watchdog group. Ruch says he had to do the research to find out that companies regularly add to their wells hazardous chemicals such as glycol and xylene. And he criticized the EPA for failing to require companies to reveal what chemicals they use when they hydraulically fracture their wells or set limits for how much of those chemicals can be released. "They don't disclose what chemicals are involved," Ruch says. "They don't have any kind of plan to monitor for them. There are no safeguards for wildlife or livestock. EPA should be ashamed of itself for this permit." EPA officials refused to give NPR an interview about these proposed permits, saying they will speak after the public comment period ends. Scientists who reviewed the proposed permits for NPR said they did not appear to set strong enough limits to protect wildlife, livestock or people. For example, EPA mentions levels of benzene that far exceed safety standards but fails to set a limit for how much is allowable. "The biggest concern is still what's in the water," says Duke University's Jackson. "It has salts, metals, radioactive elements like radium, and chemicals such as benzene, and sometimes at levels 150 times what's allowed in drinking water. Who wants to eat a cow that drinks water laced in benzene?" The proposed permits require more testing than is currently required. But Jackson says it still would be easy for oil companies to time their sampling to make the water seem cleaner than it actually is. "If I were working on that site, and I knew there was a week where the discharges [of chemicals] would be high, I certainly would not be taking my water sample at that time," Jackson says. And he says many of the contaminants will build up in the stream bottoms over time, leaving a toxic legacy for the future.